Conventional wisdom says that content marketing needs to be useful to be effective. Creating utility builds credibility and separates content marketers from advertisers. Hence, Intelligensia Coffee offers Brew Guides to teach consumers how to brew the perfect cup of coffee, and Birchbox creates how-to videos with beauty tips, such as how to get beach waves for short hair. But publishing how-to information is not the only way to be useful. As the new GE advertising spoof “Enhance Your Lighting” demonstrates, a brand can be useful by entertaining its audience. “Enhance Your Lighting” is brilliant content marketing. The two-minute short consists of a mock infotainment segment starring Jeff Goldblum. 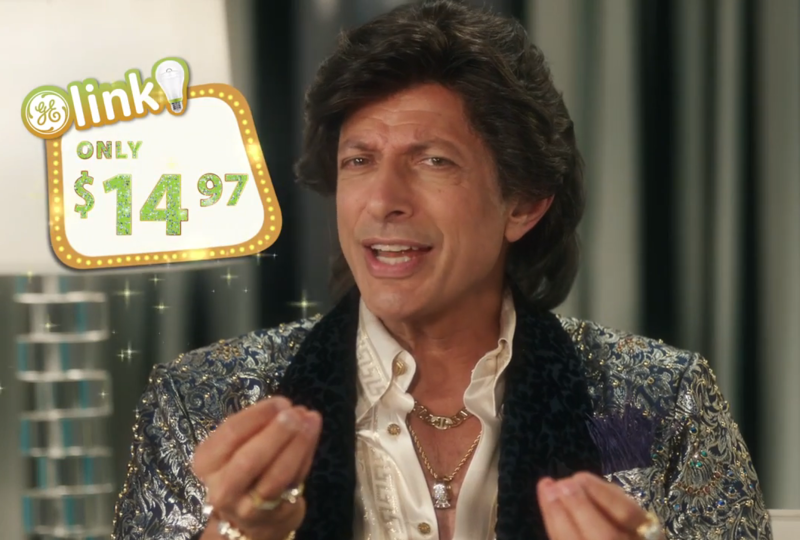 Portraying “Terry Quattro, famous person,” Goldblum delivers an over-the-top pitch for GE Link LED bulbs that pokes fun at our cultural obsession with celebrities and meaningless product endorsements. With a combination of smarminess and arrogance, Quattro extols the virtues of “really great lighting” in building his celebrity image (and in doing so makes a self-deprecating joke about Goldblum himself being 62 years in the land of youth). Then he pitches the cost-effective GE Link light bulb (which costs “less than what I tip the guy who tips people for me”). The segment is also a clever work of Trojan horse advertising: Goldblum hooks you with his jokes and, voila, the next thing you know, you are watching an advertisement for the GE light bulb. You hear everything you would expect in an ad: product features (it is smart-home friendly), benefits, and price. Yep, just like an ad . . . and yet “Enhance Your Lighting” is also content marketing. The video is an example of how copmpanies are engaging audiences with branded entertainment. For instance, in 2013, Prada created tremendous PR for its brand by teaming with director Wes Anderson to present the short film Castello Cavalcanti. The seven-minute movie stars Jason Schwartzman as the race-car driver who discovers the joys of slowing down after being stranded in a small Italian town. (The Prada branding in Castello Cavalcanti occurs as a subtle product placement. When the storyline takes hold, you have to look closely to catch the Prada name appear on the back of the uniform worn by the driver.) Branded entertainment has existed for quite some time. In the digital age, branded entertainment helps create engagement: seven minutes of anyone’s time on a digital platform is worth gold for a brand like Prada. The segment also helps GE continue to change perceptions of its company from that of ever-present utility to a cool brand. GE has earned accolades for innovative forms of content marketing such as its Tumblr site, which incorporates GIFs and images to visualize the “changing worlds of science and technology.” For instance, the site uses dramatic, in-your-face images to help you appreciate the dramatic scale of industrial technology. With “Enhance Your Lighting,” GE shows us that a $146 billion corporate conglomerate can be funny. “Enhance Your Lighting” is the latest collaboration between BBDO New York and GE. Other productions include spots such as the weird “Ideas Are Scary” and wistful “Childlike Imagination.” With “Enhance Your Lighting,” GE delivers on its “imagination at work” positioning. Indeed, it takes a lot of imagination to make a daring mock commercial work, and GE succeeds. What do you think of “Enhance Your Lighting”? This entry was posted in Marketing and tagged BBDO, David Deal, Enhance Your Lighting, GE, General Electric, Jeff Goldblum, Prada, Superhype. Bookmark the permalink.